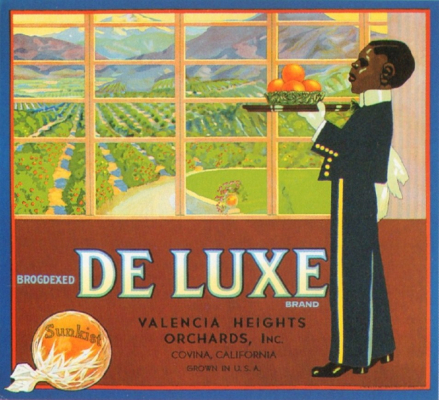 Following my article on the labels “Elite” and “Chinese” of 23 June 2015 Gielijn Escher drew my attention to two other Californian citrus box labels inspired by street posters of Ludwig Hohlwein: “De Luxe” and “Crimson Crane”. 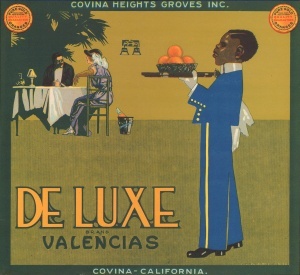 “De Luxe” has always been one of my top favorite labels, and I am happy to own the orange and the lemon version of the Covina Heights Groves Inc. label. On that label the dressy pair at the table is only needed to explain the situation. 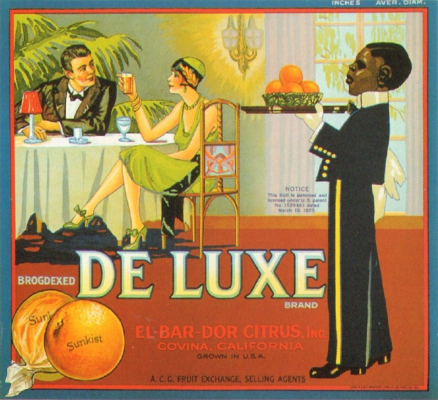 Hero of the scene is the little black waiter proudly serving a basket of oranges. 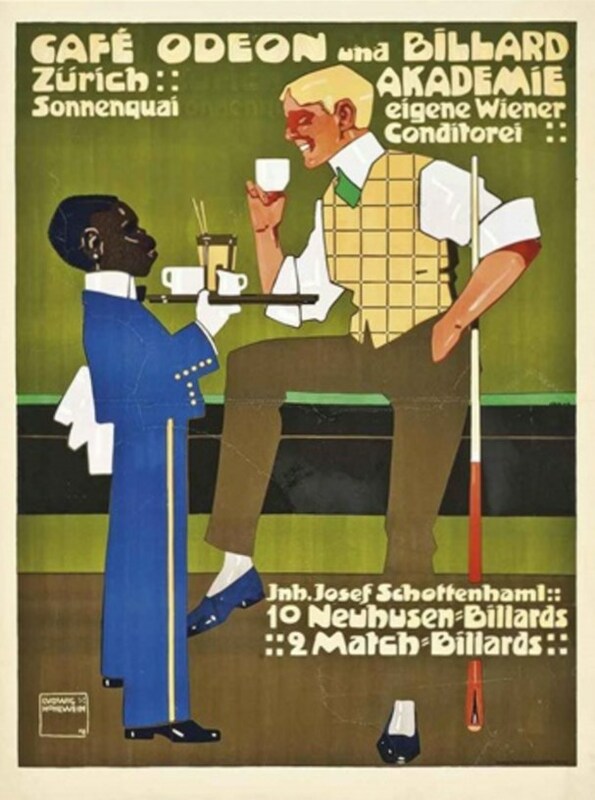 But I had not been aware of the fact that he is a clear plagiarism of the boy serving coffee to a billard player on Ludwig Hohlwein´s street poster for Café Odeon and Billard Academy in Zurich. It dates from 1908 and measures 120,4 cm x 90,5 cm. Here we have a good balance between the two figures, the waiter and the billard player. 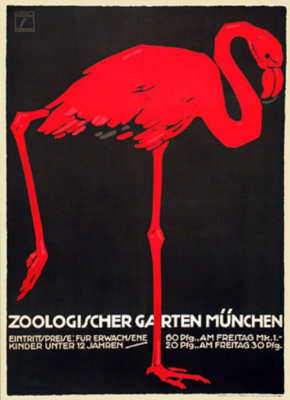 Please also compare the label “Crimson Crane” with the red flamingo drawn by Ludwig Hohlwein 1925 on one of his various street posters for the Zooligical Garden “Hellabrunn” in Munich. The flamingo is stretching its second leg backward as these birds sometimes do, at the same time nicely balancing the image on the poster and making it quite dynamic. 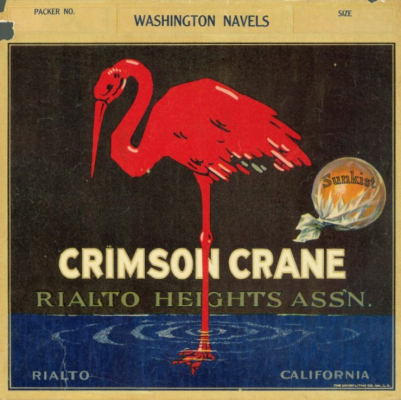 In contrast, thereto the red bird on “Crimson Crane” has only got one leg, is very static and has been turned into a red (?) crane by adding a long beak. In my view this label failed as a piece of art. What do we learn from this? : A flamingo is not easily turned into a crane.